This past September a new offering by Publisher ATARI and Game Developer David Cage of Quantic Dream was released into the Action/Adventure gaming market for the PC, PS2 and Xbox. It is known here in the United States as Indigo Prophecy and in other markets around the world as Fahrenheit. While the gaming experience isn’t perfect (is there really any game which will totally please the discriminating and decided tastes of both the “pure” Adventure Game enthusiast and the Action/fighter? Not really. ), Indigo Prophecy does come close. I always find it amusing that while I am a dyed-in-the-wool point-and-click Adventurist for some 20 years now, every once in a while I’m pulled toward the “Darkside.” By “Darkside” I mean those games which are either partially or wholly action and those adventures which contain significant action elements. So, when it befell me to review this game I approached it with some trepidation…yet was delighted to find that my experience was not unlike participating in an interactive cinematic event. “Well, what is Death then, but another chance at a ’Do-Over’”? …I have found that there are “do-overs” aplenty in Indigo Prophecy. The PC version of the game came with three CDs. Three to load and one to play off of. Technically speaking I found no problems or crashes with this game. Everything installed and worked with ease and grace. A big plus in my book, but I will warn you now that this game does have issues with video cards which cannot support T & L (Transformation & Lighting) such as the Nvidia Riva TNT or Intel integrated Video cards. Interesting to note that there is a lot of bang for the buck here. During the install, you are presented with a “quiz” about New York. Well done, gentlemen. The piece played flawlessly on my system, allowing me to change options to suit my whims and replay chapters and parts of chapters as I pleased. After the usual publisher and developers’ splash screens make their entrances and exits, one is immediately taken to a graphical PDA of sorts to enter a security Login name. Very nice. From here the gamer can set up different logins or play without them, although doing so cancels out the autosave feature…lovely. Then it’s on to the Main Menu where one can choose “Options” to set up the gaming parameters --- believe me, folks, after one or two stints of “Simon Says” it was very helpful to cancel out the default keypad settings for the PC game. I found that, ten minutes into the game, it was far easier to use the keys: ADWX for the “character left – right – up – down” than the directional keys -- but more on the interface later…. I also noticed that it is from this menu that the gamer may access the “Credits” and gain 115 Bonus points if you let them run in their entirety. One of the nicest elements that the developers placed into motion here is under the heading of “New Movie.” Click here and one is immediately given the choice of either “New Game” or “Tutorial.” Ah yes…David Cage must have had the likes of me in mind here…how sweet! Now then, you expert gun-totting-shoot-every-thing-in-sight-and-actually-hit-your-target-gamers -- quit laughing (I know who you are…). This may be a small thing, but it is a great feature for the likes of me when wishing to enjoy this type of game. And the fact that it is taught by none other than the writer/director himself made it all the better. Kudos to you, David, for thinking of us little “grannies” who secretly long to play these action games, but shy away from them because we can’t figure out how the controls work until the game is almost half over. This section gives us a chance to practice and see just how tight we need to adjust our carpal wrist braces before entering the gameworld. 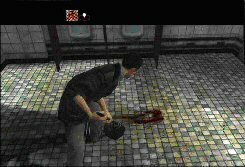 The gamer moves throughout Indigo Prophecy by use of either the mouse and/or keyboard, depending upon the situation. However, you must always stay alert and take very special care, as the directions for what to do are located at the top of the gaming screen. Many times during conversations the choice for the dialog trees are timed and the gamer is required to react quickly. Different choices will result in either a favorable or not so favorable emotional state for the character you might be playing at the time, and can sometimes result in madness or suicide. The same holds true for many of the action sequences. They are timed as well. There is no inventory to speak of in Indigo Prophecy and no inventory-based puzzles either. There are a number of “task-based” conundrums, which I found to be quite interesting. What about the length? Well, first time around I played it over a two day period, playing roughly five hours a day without a walkthrough, so that would be, let me see…ten hours. However, I was only able to find four endings and as far as I know there are six. SO…you can be very sure that I’ll be playing this one again and very soon, if only to unlock the secret levels for the movie. Did I mention that there six endings? Maybe it’s just a rumor…maybe not. There are also some “bonus point cards” to be found along the way as the story unfolds. These are used after the game is completed at the Main Menu in the Bonus Section, which I felt alone is worth the price of admission. Here one may “buy” the various tidbits and extras with the bonus points one has collected during the game. Things such as various musical cuts from the game, various action packed cut scenes from the game, some hilarious movie shorts and one incredibly beautiful artwork gallery. Well done, gentlemen, very well done! The only place wherein I feel gameplay issues exist for Indigo Prophecy is the following: many of the action sequences are driven by a “mini-game sequence” loosely referred to as “Simon Says.” Remember that from the little electronic children’s game where one has to press certain colored buttons to sounds or music? You might also remember it from the PS2 version of the Polar Express. …That was about snow too…wasn’t it? …Sorry, couldn’t resist that one. I’ll behave now. I couldn’t enjoy the action scenes in Indigo Prophecy as much as I would have liked because I had to concentrate on the “Simon Says” sequences. While it did not really bother me that this type of mini game was there, mind you… I felt that they went on for far too long. But then I’m not really an “Action-Adventurist” and maybe it’s an “Action” thing. One of the most important factors for me in a multimedia piece such as an adventure game is the musical score. Here, I am very excited to say that Indigo Prophecy did not disappoint. The theme music for the main characters was composed by Angelo Badalamenti, most famous for his movies Mulholland Drive, The Beach, Blue Velvet and the strange yet fascinating television series Twin Peaks. These themes and underscore were orchestrated by Normand Corbeil and are moody, pensive and mournful with a certain underlying urgency. The incidental score is urban, gritty and serenely melancholic with an ever-so-slightly claustrophobic and menacing touch. Marvelous stuff. It certainly tugs at your emotions and helps to draw you further in to the game’s world. But make no mistake; we’re not talking a constant funeral dirge here either by any means. As I have mentioned before, at times this was more like an interactive cinematic experience for me, rather than just another adventure game. The artwork and palette was somber and appropriately menacing where it needed to be, as well as colorful and vibrant for those scenes which reflected lighter emotions. By and large I found it haunting, urban and pensive. The voice work here was captivating and totally believable throughout the game. I found that the voices all fit the characters physically as though their utterances were indeed organic. Ensemble casting is not easy to pull off -- but for this game the actors performed as a tight unit, which just heightened the entertainment value for me. It is most probably here that I should mention (since we are on the subject of the characters themselves) how superb and lifelike were the actual movements and physical interactions of the various characters of Indigo Prophecy. Wonder why? Two things – Motion Capture. (I won’t go on about it as it is far too technical, which is why I’ve supplied a link here for those of you who are interested in exactly what went into this type of production.) But I am so very grateful that it was used…it absolutely “made” this game for me. And the other? “Split Screens.” Sometimes as many as four of them in one sequence. These added to my already heightened anxiety during “real time “ events in the game itself …very suspenseful. Now to be absolutely fair, I do have to say that for the most part the graphics in this game are not as picture perfect as they could have been. There is the occasional blockiness and pixelation; this was especially noticeable during the “bug” scene and the AI character scene…. Also some of the “set dressing” characters looked a tad unfinished to me. But wherever this may have peeked through, Indigo Prophecy made up for it in other areas. When you get the chance to play this game take note of how smoothly the shadows move as any of the main characters pass by a light source. Particularly remarkable are the facial expressions and emotions of these characters, especially Carla and Tyler when Kane escapes. That scene left me appreciatively stunned. A 31 year old Information Technology Manager of a bank. He has a penchant for Shakespeare and shall we say…psychic abilities (interesting to comment here on the choice to compare epilepsy with psychic episodes during one occasional scene in the game). Just an ordinary guy really, in possession of an ordinary face…one of the crowd, you might say. Unfortunately he finds himself in the wrong place at the wrong time. Carla is a 28 year old Homicide Investigator with the NYPD. She’s single and lives alone… I suppose her favorite motto would be: “Time waits for no man, and neither do I.” Resolute and purposeful, she brings an insightful and determined mind to her investigations. Yet there is a quiet desperation inside Carla, which rears its ugly head in the form of acute claustrophobia…interesting. At 37 years old, Markus is the older brother of Lucas Kane. From the time of their youth back at the Wishita Military Compound (can someone say Area51 here?) Markus has always tried to look after his younger brother. He is grown now and has become a priest. He had been out of touch with his brother for two years, but now finds himself drawn to him upon the occasion of the ten year anniversary of their parents’ death. Don’t expect a synopsis here, my fellow gamers. Suffice it to say that this is an intricately plotted thriller filled with plenty of angst, heartbreak and inner turmoil. In Indigo Prophecy, the gamer will take on the personae via third person view of the four main characters. It is a nonlinear game and the paths that the gamer chooses to take will have a direct result on the outcome of the game. Remember, the choices we make in our lives never leave us without consequences. This is a story about mystery, serial murder, possession, Mayan Rituals, violently cold weather, the paranormal, artificial intelligence, orphaned children, psychic visions, blood, birds, bugs, general mayhem, the occasional guitar lesson and yes, folks, The Matrix does exist here as well. Yet…believe it or not…it all ties together quite nicely into one huge rollercoaster ride. The story begins with a violent and horrific murder during a more than average blizzard one night in New York City. Within the first five minutes of this tale we know all too well who the murderer is…the question and impetus for the rest of the game then becomes -- why?